Reading through the Old Testament has always been a rewarding and yet difficult challenge for me. This summer, I have a new-found love for a couple books that I have really struggled through in the past. I think my understanding and new appreciation for these books began in April when Grant and I attended T4G and I heard this message by Ligon Duncan on Numbers 5. There are a handful of sermons that I know almost by heart because God has used them so profoundly to impact me. This message on Numbers immediately became one of them. I thought about it for days afterward and four months later I am still thinking about it. When I began asking this question, I started seeing more than difficult laws, strange rituals, and scary skin conditions…I started seeing Jesus. Jen Wilkin, in her new book, Women of the Word, discusses many helpful principles for how we should approach our study of the Bible. She rightly points out the importance of understanding the “Big Story” of the Bible as we study individual books of the Bible. Perspective is so crucial to life. It matters in singleness, marriage, in mothering. It’s typically pretty easy to distinguish those who have perspective and those who do not. Without perspective we can quickly get lost in the loneliness, the mundane, and the trials. The same is true in our study of Scripture. Without the proper context, I have gotten lost in many passages that are actually amazingly rich and deep. Of course, this is why it’s important to read through the Old and New Testaments, to meditate on the Psalms and learn from the Prophets…because then we began to see how all of Scripture fits together and how every single book is pointing to Jesus. When I’m reading through a difficult book, I like to have my study Bible and a good commentary handy when I get lost or confused. I also try to listen to sermons that correspond with what I am studying in Scripture. And it sure is nice having a seminary husband to ask difficult questions and share what I am learning. This summer, Leviticus and Numbers have taught me so much about the holiness of God, the vileness of my own sin, and most of all the love of Jesus. The sinless One, touching the unclean and making them clean. 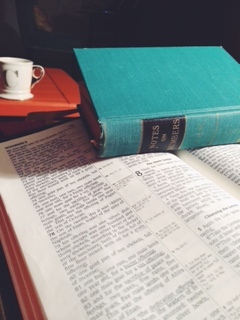 The Gospel in Leviticus and Numbers…one of my greatest joys this summer of 2014. What is the Lord teaching you through His Word this summer? I really enjoyed this short video of Kristie Anyabwile as she shares how God used the book of Leviticus in her life. I had lofty goals of writing lengthy book reviews on this site – both to help my own retention and encourage others as well. I’ve realized, however, that in my particular season of life, if I spend time writing lengthy reviews I won’t have time to finish the books I am currently reading! Instead, I’m going to try to share the titles of books I’ve recently read, gleaned much from, and think others may enjoy as well! This book. If you are a female, get your hands on a copy of this book! It was just released and I read it in one sitting. Yes, it was a very long sitting, but that’s how wonderful this book is. Your soul will be nourished. Your heart encouraged and yes, convicted. This will definitely be one of those books I will recommend over and over again and reread in the future. Be Still My Soul. If you are going through a trial, this book will encourage your soul greatly. Elisabeth Elliot’s wisdom is timeless – and that’s because it is rooted in God’s Word. The biggest takeaway I had from this book is how the shortcut to peace is acceptance of God’s will. Even if you aren’t going through a hard time, I think this book will encourage you, but especially if you are, it will be like water in a dry place. Instructing a Child’s Heart. This is one of those books I’ve had laying around our place forever but never actually cracked it open to read it. I finally read it last month in conjunction with a parenting class I was taking at Southern Seminary. I really enjoy a book that is packed with Scripture, and this one is. I’m in the middle of a couple other books and once I finish them I will probably post those as well. But these last two books are just for fun! 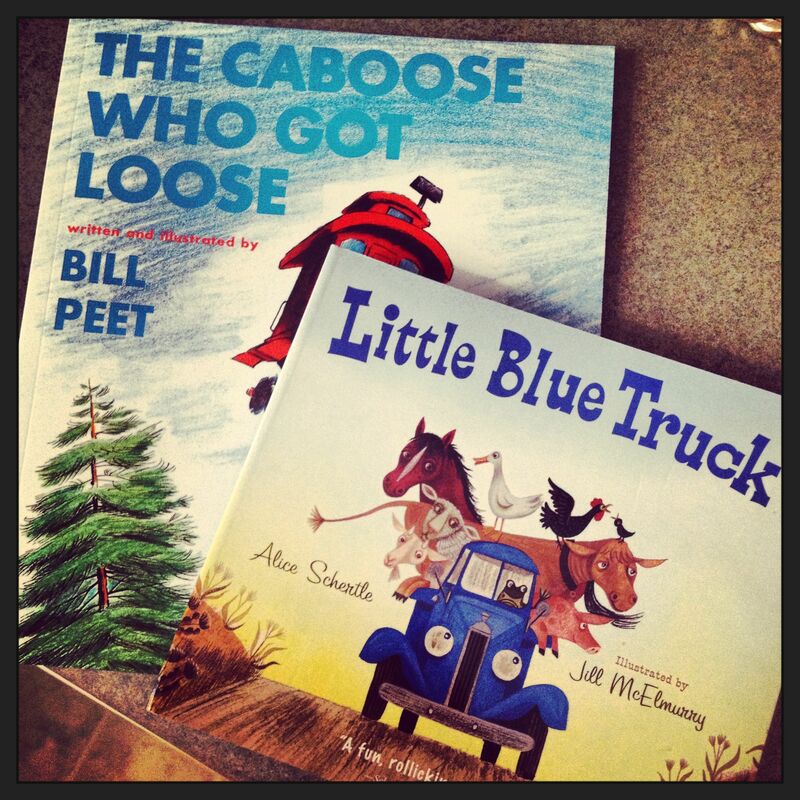 I just discovered the wonderful rhyming goodness of Little Blue Truck and Little Blue Truck Leads the Way. Even though I have girls, these are already favorites (for them and me!). And we are just ever so slightly entering the world of Bill Peet. AudreyKate is still a little young for these books, but I read as long as she will last! I know I’m overly entertained by the personification of inanimate objects and animals. Hope these titles encourage you. 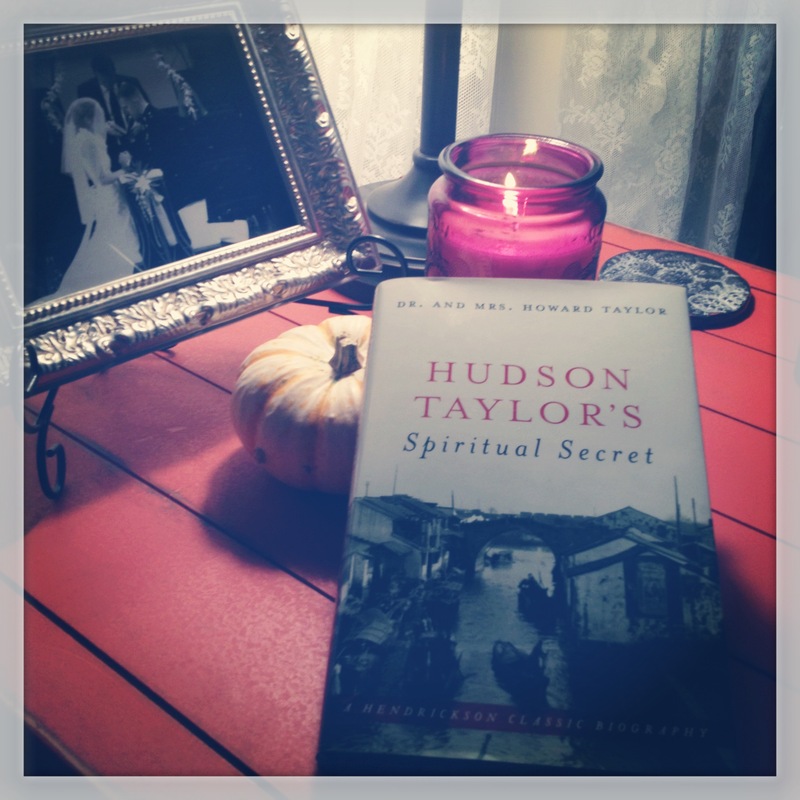 I’ve owned Hudson Taylor’s Spiritual Secret for over five years. I bought it at the recommendation of a friend right after I graduated from college. I had every intention of reading it back then, but when I fell in love with a certain Texan, it was forgotten. It sat on my desk for quite some time until I finally shelved it, resolving I would one day pick it back up. I’m so glad I finally did, and even though it took me half a decade to do so, it was probably more beneficial to me in my stage of life now then it would have been then. Hudson Taylor’s Spiritual Secret is written by his second son, Frederick Taylor, and his wife, Mary. It covers a general summary of Hudson Taylor’s life and ministry and is perfect for someone (like me) who wants to learn more about this mighty missionary but doesn’t have hours to devote to detailed volumes. Hudson Taylor was born in 1832 in England and became a believer in Jesus Christ in 1849. His conversion is a beautiful story that speaks to the godly faithfulness of his mother. She was out of town, spending the day with friends, when she was particularly burdened for her son’s salvation. She left the group for several hours and prayed fervently on her knees until she finally felt God had answered her prayers. Meanwhile, miles away from his mom, young Hudson believed in “the finished work of Christ (3).” His lifelong “call” to share Christ with the people of China came shortly after his conversion. Hudson had grown up hearing his father’s prayers for the unreached people of China, so the country was dear to his heart. Once his calling from God came, Taylor never looked back for he was “not disobedient to the heavenly vision (8).” His whole life was dedicated to reaching the Chinese for Christ, no matter the trials and hardships that came with this mission. He was unwaveringly committed, and he sacrificed all for China: the death of his child, Gracie, his wife and “heart-friend” Maria, his second wife, Emily, and finally in 1905, he went home to be with the Lord from Hunan. What made this man sacrifice so much for the salvation of the Chinese? Most of the fruit of his ministry (the millions saved through the ministry of The China Inland Mission) he never witnessed in his lifetime. There were two things that really gripped me as I read this book that I think set Hudson Taylor apart as one of the mightiest missionaries of the faith: his heart for the lost and his unwavering faith in God. Hudson Taylor wasn’t just called to a country, he was called to a people. He wasn’t content in simply knowing Christ for himself, his soul grieved for those who did not know Christ. So much so, that many nights he could not sleep because “every day tens of thousands in that land were passing away into Christ-less graves (87).” His passionate heart for the lost caused me to examine my own heart for those who don’t know the truth of Christ and made me wonder what the world would be like if there were more men and women who lost sleep just by thinking of those who do not know the Savior. But Hudson’s life of sacrifice was not ultimately for the Chinese, but for Christ. Speaking of the trials and suffering he experienced, Hudson said, “I never made a sacrifice (15).” Giving was receiving for Hudson Taylor, and the rewards of knowing Christ brought such joy that any suffering paled in comparison. He wrote in a letter to his mother, “Should we not rejoice when we can give up anything for the Savior? (16).” And his love and faith in God is what marked this man and enabled him to labor and suffer much for the name of Christ. There is much more I could share about what touched my heart as I read this book. One other part of Hudson’s life that spoke volumes to me was his romance with Maria Dyer. They had the same heart for the Chinese people and felt assured they were, “Two whom God hath chosen to walk together before Him (64).” However, Maria’s guardian, Miss Aldersey (her parents were dead), would have nothing of Hudson Taylor, “that young, poor, unconnected Nobody (64).” She told Maria that she must break off her relationship with Hudson at once. Even though she was heartbroken, she trusted that nothing was too hard for the Lord and that he would bring them together if it was his will, “If he has to slay my Isaac…I know he will restore (64).” She respected the authority God placed in her life and God answered her prayers, bringing her and Hudson back together in his perfect timing. Her trust in God speaks loudly to young, Christian men and women who do not respect their parents’ decisions regarding relationships (whether they want them to wait to marry, or finish school, or end a relationship). Even though Maria loved Hudson and knew that Miss Aldersey was wrong in her judgment of him, she trusted in the God who can change the hearts of kings. We have much to learn from her faith when it comes to trusting God. I had to ask myself, Do I trust God like that? Do I desire His will even at times when it comes in direct conflict with my own? I only have two points of concern that I will quickly address as I wrap this up. First, I was deeply saddened when I read that Hudson and Maria sent their children back to England because the conditions in China were so terrible for their health. I wasn’t troubled that they went back, but that they were separated from their parents. Their youngest child at the time (only five), was extremely sick and his condition seemed to worsen at the thought of being separated from his parents (141). He died in his mother’s arms the night before the journey to England. Hudson and Maria had a deep faith in God and love for the Chinese, but what about their love for their children? 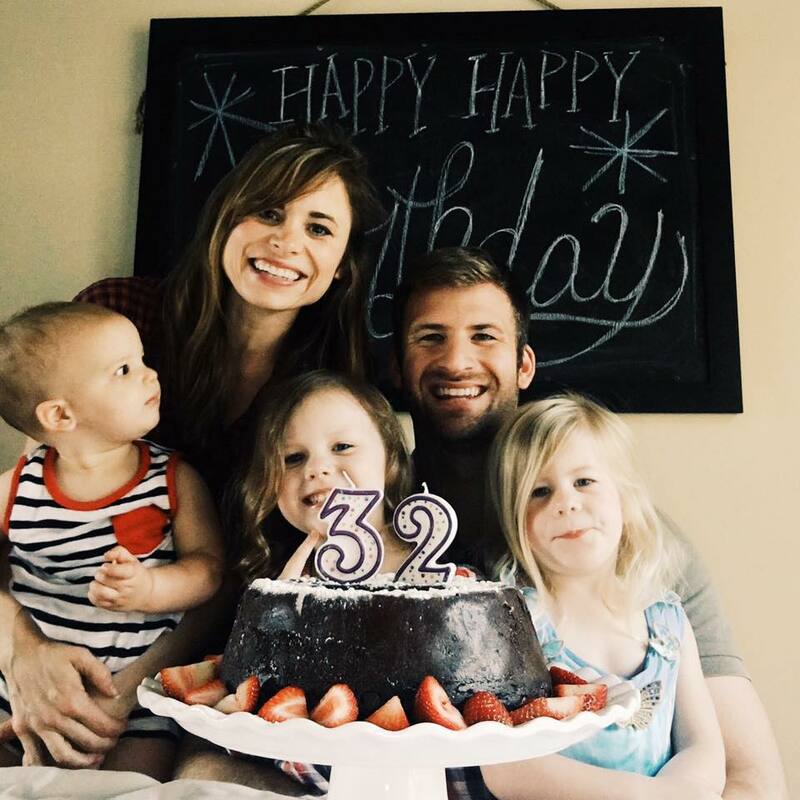 I know they loved them deeply, so it seems they could have gone home for a season (while their children grew up) supporting the mission work in China and helping to send out missionaries? It was after their children left that Maria’s condition deteriorated, which led to her early death. As mothers, our primary ministry is our children, and I can’t imagine the pain and heartbreak Maria experienced (and her children) as she sent them away on that boat, never to see them again on this earth. I am so glad I read this biography. I was very moved as I read the details of Hudson Taylor’s conversion, call to ministry, preparation for ministry, early years in China (which included dressing like the Chinese), his romance with Maria, their perseverance through trials in ministry, the death of their daughter, Gracie, and more. But to be honest, after I read that they sent their children back to England, it was really difficult for me to pick the book back up again. As a young mother myself, I kept picturing that little boy’s broken heart at the thought of being separated from his mom. I felt disappointed. However, I’m so glad I didn’t let that keep me from finishing the book, and I was reminded that every hero of the faith has flaws. No matter how great and godly a person may be, there will always be things about someone that will disappoint us. We must remember not to hold people on pedestals, but remember they are imperfect people (like us) that God uses for His great glory. They point us to the Perfect One, Christ, and they would never want to do anything different. I was also comforted by the fact that Hudson’s son (Frederick), who wrote the book, obviously loved the Lord deeply, so God was gracious and faithful in all of it. This is an important biography of one of the greatest English-speaking missionaries to have ever lived. I hope you will be strengthened in your own walk with Christ through the faith of Hudson Taylor.